NEI Glass offers replacement and installation services for all the glass in your home. We can custom cut and frame mirrors in every shape and size, find an exact replacement for a broken glass table top, and install or replace glass shelving units. When glass in your home breaks, chips or cracks, call NEI Glass, a name trusted throughout Northeast Indiana for over 20 years! Looking for the perfect mirror to complete your space? NEI Glass can make it for you! 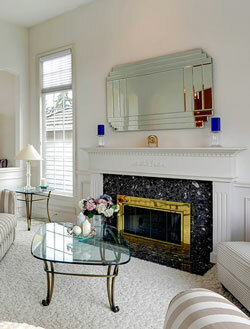 We fabricate mirrors in all shapes and sizes for decorating a living room or covering an entire wall in a dance studio. We can also work with your interior designer to come up with the perfect size, shape and frame for your new mirror to complement any existing decor. Decorative mirrors are the perfect way to bring natural light into a room and provide a sense of space for small areas. Custom mirror etching can also make an impact on design. Why limit yourself to a plate of glass when you can add shapes, designs, or even text to your new mirror! Designing in glass has become a very popular element in furniture and home offices. When the surface you work with is clear, it is the extra details that help the piece shine. NEI Glass offers several edging and beveling styles and a variety of textures and colors to make your new glass desk or glass table top one of a kind! Having trouble finding an exact replacement for a broken glass top? NEI Glass can duplicate it for you down to the last detail!